What do whales, chronographs and solar charging have in common? And no, I’m not talking about a hypothetical scheme involving Elon Musk, and the launching of an around the world race, with solar-powered propellers attached to specially trained whales. Cool as that may be – although probably not humane – all three things become one in the Seiko Prospex ‘Save The Ocean’ SSC675P. 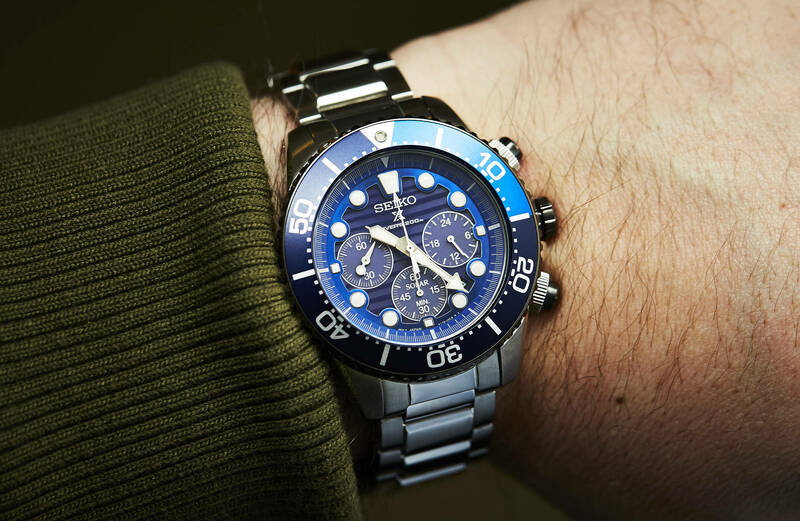 If you’re not already familiar with this year’s ‘Save The Ocean’ series by Seiko, a portion of all sales from each of the series’ three models goes towards saving the ocean. 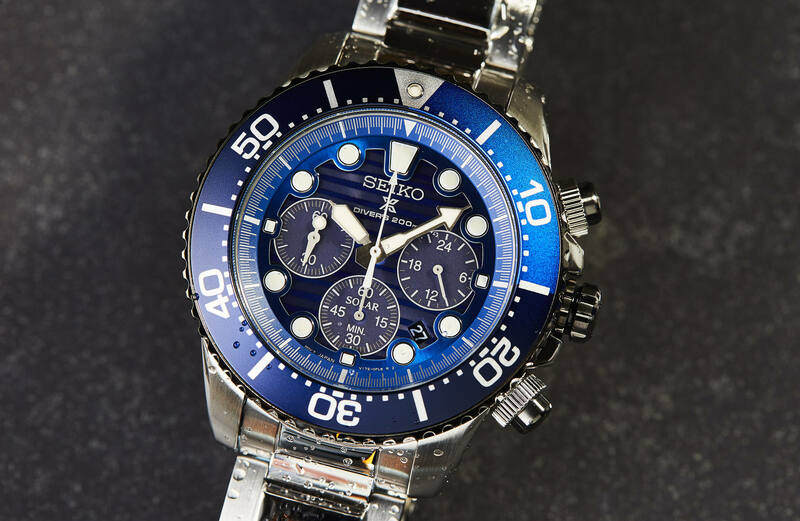 With Seiko working in conjunction with noted marine conservationist Fabien Cousteau. 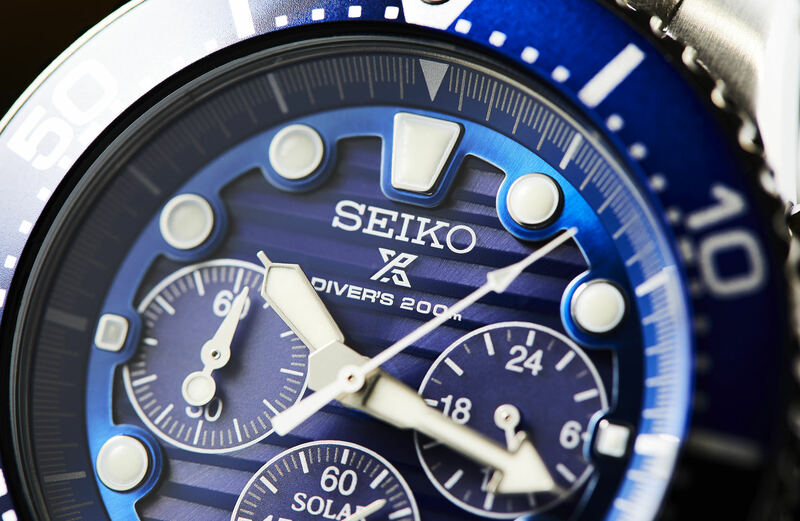 Each special edition watch in the series features a wave-like dial resembling the skin of the mighty blue whale. However, while the other two watches in the series are strictly automatic three-handed affairs, and their dials graduate from an iridescent blue at the top to an almost black at the bottom, the dial of this version differs ever so slightly and maintains its own intense shade of blue throughout – although in certain light, you’d be forgiven for seeing purple. And contrast is introduced by the equally as blue bi-coloured bezel and the radiant outer ring that surrounds its hour markers. The dial is also more complicated, with a 60-minute chronograph counter at 6 o’clock, a small seconds subdial at 9, and a 24-hour subdial at 3. And sitting just behind are solar panels that power the quartz V175 Seiko movement inside. As with any ocean-themed timer, where’s the fun if you can’t take it into the water with you? Luckily, this diver is good for 200 metres. With a screw-down crown and pushers sealing up a rock-solid 43.5mm stainless-steel case. 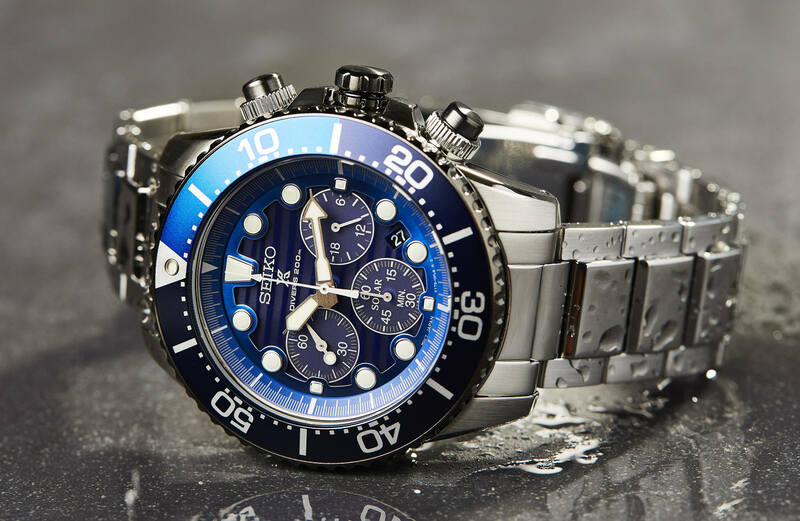 While Seiko’s own Lumibrite lume lights up even the darkest of depths, and a three-fold clasp with secure lock, push release, and diver’s extension holds it in place as you explore land or sea. One of my favourite things about Seiko’s Prospex Solar Diver Chronographs has always been their dials and their multiple layers that draw in your gaze. With a new-found ocean depth, however, you’d be best to not fall in, lest you get wet.